With a full range of linear systems Myostat has a motion control solution that fits. A ball screw actuator is a precision linear solution that is used to drive a system. With enclosed recirculating ball bearings that travel on a threaded shaft with minimal friction, the ball screw actuator acts as a precision screw that is able to accommodate heavy loads. The assembly acts as a nut, and travels along the helical raceway on the shaft, converting rotary motion to linear motion. Because ball bearings have a low compressibility, ball screw actuators are rigid, highly accurate, and precise. With the bearing’s minimal rolling resistance, the actuator offers high thrust capabilities and are typically over 90% efficient. The minimal friction inherent in ball screw actuators extends life span past lead screw systems and reduces maintenance with the decreased demand for lubrication. Frequently used in machine tools, robots and precision assembly devices, the ball screw actuator offers smooth motion, efficiency, accuracy, and precision—ideal characteristics for many linear motion systems. 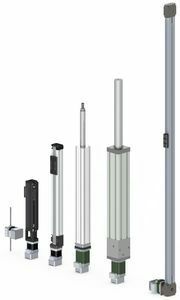 Discover Myostat’s precision linear solutions and our selection of ball screw actuators, or contact us for more information. Every actuator Myostat provides is available with an optional Cool Muscle integrated servo motor complete with all the features and benefits on an integrated servo system.